Temple Rebuilt by the Romans. Relations Between Jews and Samaritans. Samaritan Version of the Pentateuch. The "Samaritic" Version and Targum. Renascence in the Fourteenth Century. 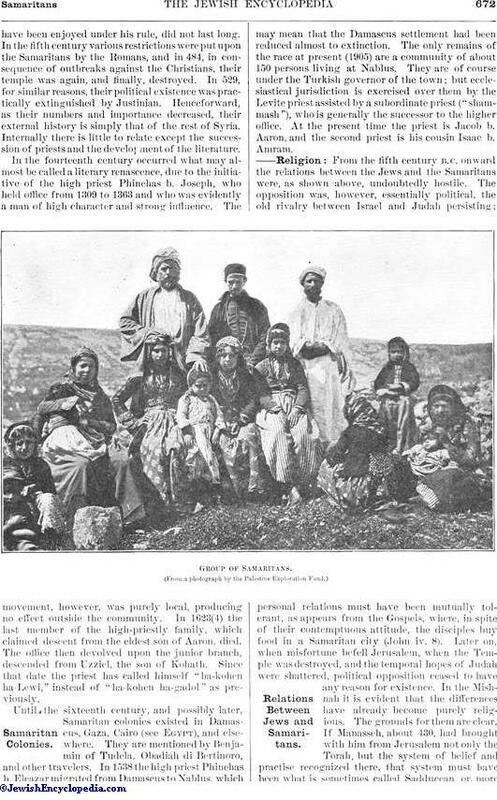 Properly, inhabitants of Samaria. The name is now restricted to a small tribe of people living in Nablus (Shechem) and calling themselves "Bene Yisrael," or sometimes . Their history as a distinct community begins with the taking of Samaria by the Assyrians in 722 B.C. View of Samaria from the Southeast. On the separation of Israel and Judah, the ancient city of Shechem, which had been from the first so intimately connected with the history of Israel, became naturally the religious center of the Northern Kingdom. The political capital, however, was transferred by Omri to his newly built city of Samaria about 883 B.C., and the Israelitish kingdom continued to exist there until it fell before Assyria. In the fourth year of Hezekiah "Shalmaneser, King of Assyria, came up against Samaria, and besieged it. And at the end of three years they took it" (II Kings xviii. 9). The inhabitants were deported to various parts of Assyria and to "the cities of the Medes"; and colonists were sent to take their place. The colonists were soon after troubled by lions, which they regarded as a divine visitation dueto their ignorance of the "manner of the god of the land." At their request an Israelitish priest was sent to them, who settled at Beth-el (ib. xvii. 28), with the result that a mixed form of religion was established, partly Israelitish and partly idolatrous. The next reference to the people of Samaria, regarded as the remnant of Israel, is when Josiah suppressed the high places among them (ib. xxiii. 15, 19 et seq.) and collected money to repair the house of the Lord, from "Manasseh and Ephraim, and of all the remnant of Israel" (II Chron. xxxiv. 9). That the Israelitish element still held its own in the north, is shown by the incidental mention "That there came certain from Shechem, from Shiloh, and from Samaria," in the time of Jeremiah, desiring to join in the offerings at the Temple (Jer. xli. 5). Later on (and this is the last mention of the Samaritans in the Old Testament), their claim to a participation in the building of the Temple was rejected by Zerubbabel (Ezra iv. 3), no doubt on the ground of their mixed origin. From a comprehensive view of the history of the period it is clear that several causes must have contributed to foster the revolt which ended so disastrously for Samaria. Tiglath-pileser III. (Pul) had died in 727 B.C., and it may well have been supposed that his successor, Shalmaneser IV., would find difficulties enough to occupy his attention elsewhere. Egypt had the best of reasons for encouraging rebellion in Syria as one means of checking the dangerously near approach of Assyria. The inhabitants of Samaria probably believed their city to be impregnable; but Assyria could not tolerate such an attack on her prestige. No sooner was Shalmaneser established on the throne than he must have started on a punitive expedition to Syria, and the fate of Samaria was sealed. He began the siege apparently in person, but did not live to see its inevitable result; for he died in 723. The city actually fell in the reign of his successor, Sargon (722), who, according to his own account, carried away 27,290 of the people. It is not to be supposed, however, that the country was in any sense depopulated by this means, though the persons removed were undoubtedly the more prominent and dangerous of the inhabitants, the rich, the priests, and the ruling class. But even such drastic measures did not entirely break the spirit of rebellion; for in 720 Syria had again united against the common enemy, and a fresh campaign became necessary. With this the political existence of Samaria ceased. 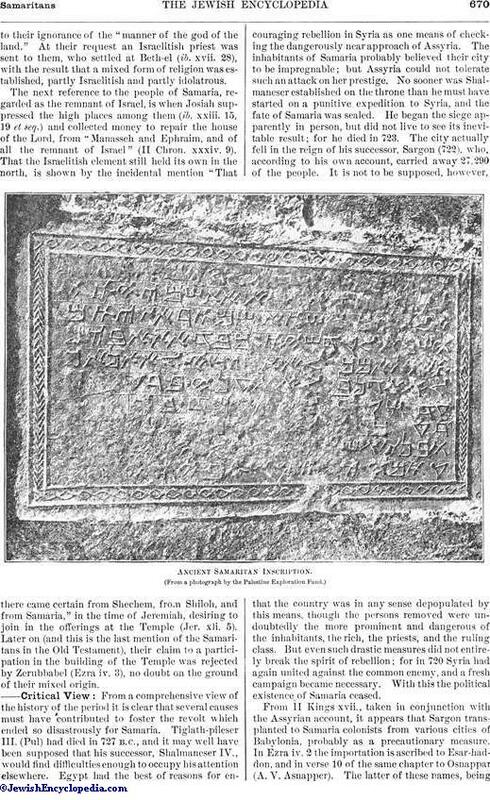 From II Kings xvii., taken in conjunction with the Assyrian account, it appears that Sargon transplanted to Samaria colonists from various cities of Babylonia, probably as a precautionary measure. In Ezra iv. 2 the importation is ascribed to Esar-had-don, and in verse 10 of the same chapter to Osnappar (A. V. Asnapper). The latter of these names, beingone not otherwise known either in the Biblical or in the Assyrian records, is probably a popular corruption. In the Assyrian accounts Sargon, as mentioned above, and Assurbanipal (669-625) are the kings who declare that they sent settlers into Samaria. Of course Esar-haddon may have done the same. The views now generally held are (1) that "Osnappar" is a corruption of "Esar-haddon," or (2) that "Osnappar" is a corruption of "Assurbanipal," or (3) that "Osnappar" and "Esar-haddon" are both corruptions of "Assurbanipal." The first is perhaps the simplest; according to it there were three importations of foreigners: (1) by Sargon; (2) by Esar-haddon, of which no record has yet been found on the Assyrian monuments; and (3) by Assurbanipal. The population, therefore, which then occupied the site of the defunet kingdom of Israel, and which was thenceforth properly called Samaritan, consisted of a substratum (probably a strong one) of Israelites, chiefly the poorer sort, with an unknown proportion of aliens, under an Assyrian governor. It was only natural that a population so constituted, and deprived of its priestly caste, should find itself ignorant of "the manner of the god of the land," and should ask for the services of a priest. 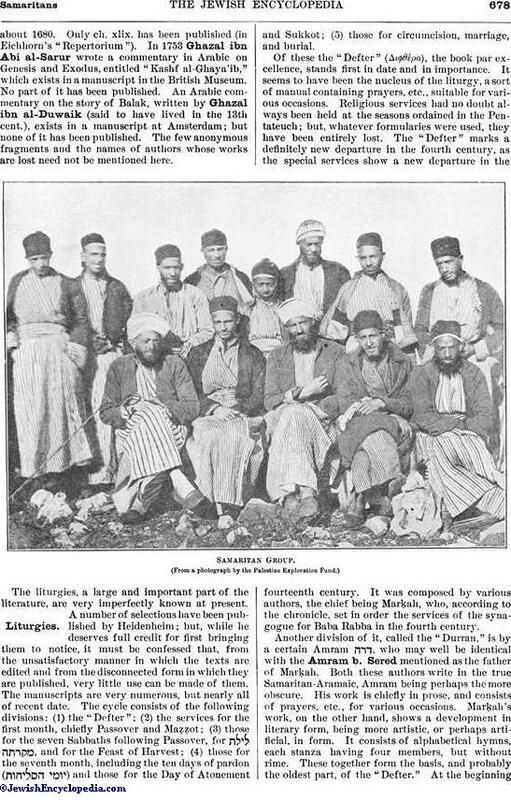 The Samaritans now disappear from the Old Testament and from the Assyrian accounts; and for the next stage in their career historians are dependent on Josephus. The empire of the world passed from Assyria to the Persians under Cyrus, and Samaria was governed by a Persian satrap. The rejection of Samaritan cooperation, as mentioned in Ezra iv. 3, and their consequent attempt to prevent the building of the Temple by an appeal to Xerxes, rendered a reunion with Judah clearly impossible. On the other hand, Samaria became the natural and conveniently placed refuge for all who were dissatisfied with the stringent reforms taking place in Jerusalem. The most important of these malcontents was the priest Manasseh; but Josephus' account of his secession is full of difficulty. 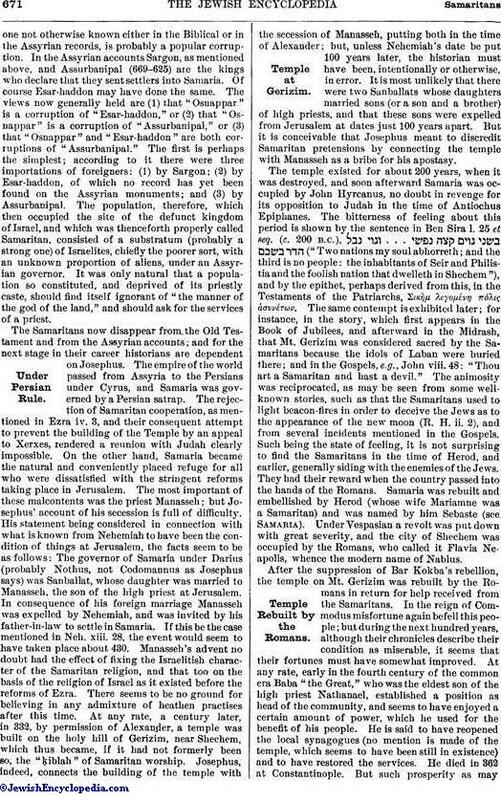 His statement being considered in connection with what is known from Nehemiah to have been the condition of things at Jerusalem, the facts seem to be as follows: The governor of Samaria under Darius (probably Nothus, not Codomannus as Josephus says) was Sanballat, whose daughter was married to Manasseh, the son of the high priest at Jerusalem. In consequence of his foreign marriage Manasseh was expelled by Nehemiah, and was invited by his father-in-law to settle in Samaria. If this be the case mentioned in Neh. xiii. 28, the event would seem to have taken place about 430. Manasseh's advent no doubt had the effect of fixing the Israelitish character of the Samaritan religion, and that too on the basis of the religion of Israel as it existed before the reforms of Ezra. There seems to be no ground for believing in any admixture of heathen practises after this time. 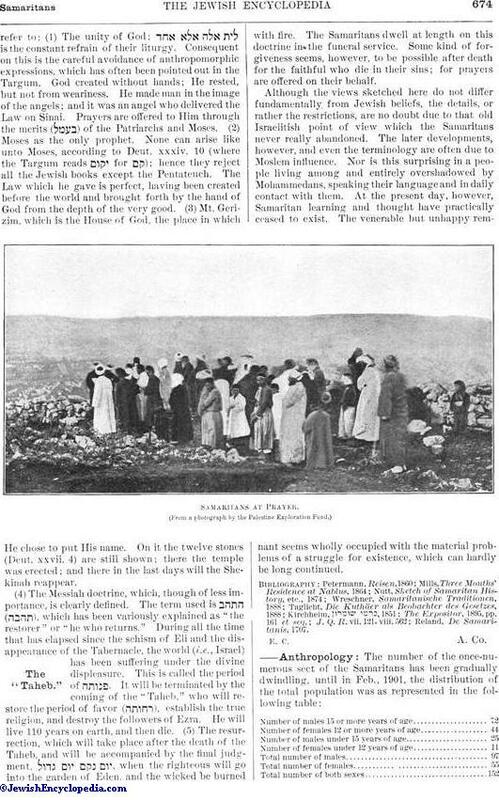 At any rate, a century later, in 332, by permission of Alexander, a temple was built on the holy hill of Gerizim, near Shechem, which thus became, if it had not formerly been so, the "ḳiblah" of Samaritan worship. Josephus, indeed, connects the building of the temple with the secession of Manasseh, putting both in the time of Alexander; but, unless Nehemiah's date be put 100 years later, the historian must have been, intentionally or otherwise, in error. It is most unlikely that there were two Sanballats whose daughters married sons (or a son and a brother) of high priests, and that these sons were expelled from Jerusalem at dates just 100 years apart. But it is conceivable that Josephus meant to discredit Samaritan pretensions by connecting the temple with Manasseh as a bribe for his apostasy. The temple existed for about 200 years, when it was destroyed, and soon afterward Samaria was occupied by John Hyrcanus, no doubt in revenge for its opposition to Judah in the time of Antiochus Epiphanes. The bitterness of feeling about this period is shown by the sentence in Ben Sira l. 25 et seq. (c. 200 B.C. ), ("Two nations my soul abhorreth; and the third is no people: the inhabitants of Seir and Philistia and the foolish nation that dwelleth in Shechem"), and by the epithet, perhaps derived from this, in the Testaments of the Patriarchs, ΣικὴΜ λελομήνη πόλις ἀσυνήτων. The same contempt is exhibited later; for instance, in the story, which first appears in the Book of Jubilees, and afterward in the Midrash, that Mt. Gerizim was considered sacred by the Samaritans because the idols of Laban were buried there; and in the Gospels, e.g., John viii. 48: "Thou art a Samaritan and hast a devil." The animosity was reciprocated, as may be seen from some well-known stories, such as that the Samaritans used to light beacon-fires in order to deceive the Jews as to the appearance of the new moon (R. H. ii. 2), and from several incidents mentioned in the Gospels. Such being the state of feeling, it is not surprising to find the Samaritans in the time of Herod, and earlier, generally siding with the enemies of the Jews. They had their reward when the country passed into the hands of the Romans. Samaria was rebuilt and embellished by Herod (whose wife Mariamne was a Samaritan) and was named by him Sebaste (see Samaria). 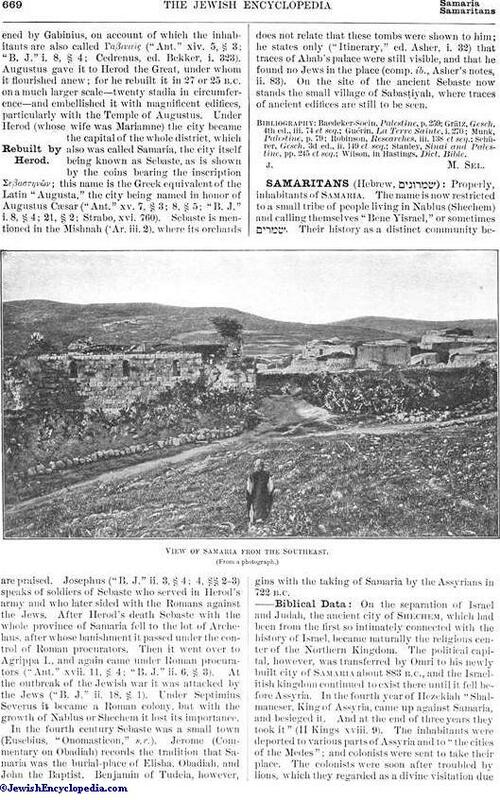 Under Vespasian a revolt was put down with great severity, and the city of Shechem was occupied by the Romans, who called it Flavia Neapolis, whence the modern name of Nablus. After the suppression of Bar Kokba's rebellion, the temple on Mt. Gerizim was rebuilt by the Romans in return for help received from the Samaritans. In the reign of Commodus misfortune again befell this people; but during the next hundred years, although their chronicles describe their condition as miserable, it seems that their fortunes must have somewhat improved. At any rate, early in the fourth century of the common era Baba "the Great," who was the eldest son of the high priest Nathanael, established a position as head of the community, and seems to have enjoyed a certain amount of power, which he used for the benefit of his people. He is said to have reopened the local synagogues (no mention is made of the temple, which seems to have been still in existence) and to have restored the services. He died in 362 at Constantinople. But such prosperity as mayhave been enjoyed under his rule, did not last long. In the fifth century various restrictions were put upon the Samaritans by the Romans, and in 484, in consequence of outbreaks against the Christians, their temple was again, and finally, destroyed. In 529, for similar reasons, their political existence was practically extinguished by Justinian. Henceforward, as their numbers and importance decreased, their external history is simply that of the rest of Syria. Internally there is little to relate except the succession of priests and the development of the literature. In the fourteenth century occurred what may almost be called a literary renascence, due to the initiative of the high priest Phinehas b. Joseph, who held office from 1309 to 1363 and who was evidently a man of high character and strong influence. The movement, however, was purely local, producing no effect outside the community. In 1623(4) the last member of the high-priestly family, which claimed descent from the eldest son of Aaron, died. The office then devolved upon the junior branch, descended from Uzziel, the son of Kohath. Since that date the priest has called himself "ha-kohen ha-Lewi," instead of "ha-kohen ha-gadol" as previously. Until the sixteenth century, and possibly later, Samaritan colonies existed in Damascus, Gaza, Cairo (see Egypt), and elsewhere. They are mentioned by Benjamin of Tudela, Obadiah di Bertinoro, and other travelers. 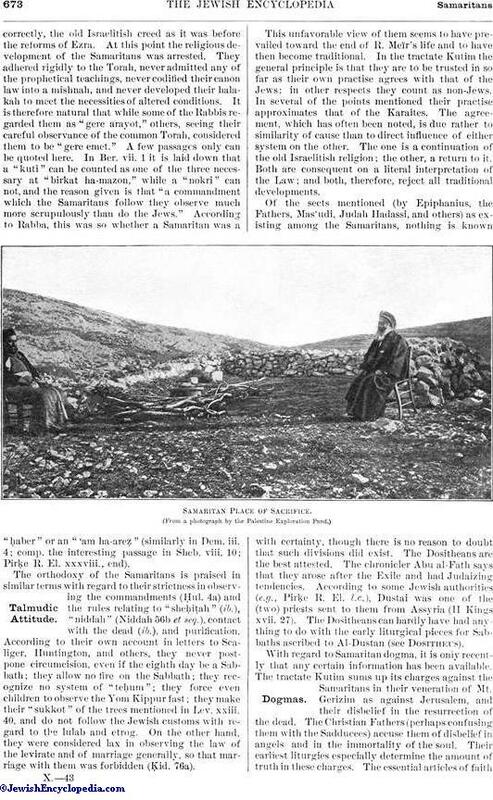 ln l538 the high priest Phinehas b. Eleazar migrated from Damascus to Nablus, which may mean that the Damascus settlement had been reduced almost to extinction. 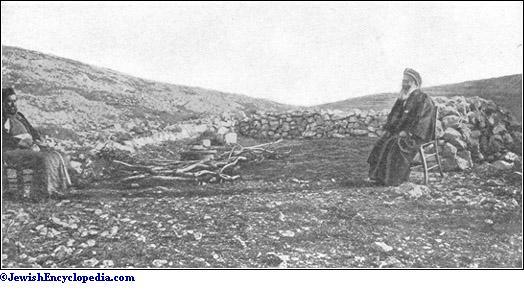 The only remains of the race at present (1905) are a community of about 150 persons living at Nablus. They are of course under the Turkish governor of the town; but ecclesiastical jurisdiction is exercised over them by the Levite priest assisted by a subordinate priest ("shammash"), who is generally the successor to the higher office. At the present time the priest is Jacob b. Aaron, and the second priest is his cousin Isaac b. Amram. From the fifth century B.C. onward the relations between the Jews and the Samaritans were, as shown above, undoubtedly hostile. The opposition was, however, essentially political, the old rivalry between Israel and Judah persisting; personal relations must have been mutually tolerant, as appears from the Gospels, where, in spite of their contemptuous attitude, the disciples buy food in a Samaritan city (John iv. 8). Later on, when misfortune befell Jerusalem, when the Temple was destroyed, and the temporal hopes of Judah were shattered, political opposition ceased to have any reason for existence. In the Mishnah it is evident that the differences have already become purely religious. The grounds for them are clear. If Manasseh, about 430, had brought with him from Jerusalem not only the Torah, but the system of belief and practise recognized there, that system must have been what is sometimes called Sadducean, or, morecorrectly, the old Israelitish creed as it was before the reforms of Ezra. At this point the religious development of the Samaritans was arrested. They adhered rigidly to the Torah, never admitted any of the prophetical teachings, never codified their canon law into a mishnah, and never developed their halakah to meet the necessities of altered conditions. It is therefore natural that while some of the Rabbis regarded them as "gere arayot," others, seeing their careful observance of the common Torah, considered them to be "gere emet." A few passages only can be quoted here. In Ber. vii. 1 it is laid down that a "kuti" can be counted as one of the three necessary at "birkat ha-mazon," while a "nokri" can not, and the reason given is that "a commandment which the Samaritans follow they observe much more scrupulously than do the Jews." According to Rabba, this was so whether a Samaritan was a "ḥaber" or an "'am ha-areẓ" (similarly in Dem. iii. 4; comp. the interesting passage in Sheb. viii. 10; Pirḳe R. El. xxxviii., end). The orthodoxy of the Samaritans is praised in similar terms with regard to their strictness in observing the commandments (Ḥul. 4a) and the rules relating to "sheḥiṭah" (ib. ), "niddah" (Niddah 56b et seq. ), contact with the dead (ib. ), and purification. According to their own account in letters to Scaliger, Huntington, and others, they never postpone circumcision, even if the eighth day be a Sabbath; they allow no fire on the Sabbath; they recognize no system of "teḥum"; they force even children to observe the Yom Kippur fast; they make their "sukkot" of the trees mentioned in Lev. xxiii. 40, and do not follow the Jewish customs with regard to the lulab and etrog. On the other hand, they were-considered lax in observing the law of the levirate and of marriage generally, so that marriage with them was forbidden (Ḳid. 76a). This unfavorable view of them seems to have prevailed toward the end of R. Meïr's life and to have then become traditional. In the tractate Kutim the general principle is that they are to be trusted in so far as their own practise agrees with that of the Jews: in other respects they count as non-Jews. In several of the points mentioned their practise approximates that of the Karaites. The agreement, which has often been noted, is due rather to similarity of cause than to direct influence of either system on the other. The one is a continuation of the old Israelitish religion; the other, a return to it. Both are consequent on a literal interpretation of the Law; and both, therefore, reject all traditional developments. Of the sects mentioned (by Epiphanius, the Fathers, Mas'udi, Judah Hadassi, and others) as existing among the Samaritans, nothing is known with certainty, though there is no reason to doubt that such divisions did exist. The Dositheans are the best attested. The chronicler Abu al-Fatḥ says that they arose after the Exile and had Judaizing tendencies. According to some Jewish authorities (e.g., Pirḳe R. El. l.c. ), Dustai was one of the (two) priests sent to them from Assyria (II Kings xvii. 27). The Dositheans can hardly have had anything to do with the early liturgical pieces for Sabbaths ascribed to Al-Dustan (see Dositheus). (From a photograph by the Palestine Exploration Fund.)Dogmas. (1) The unity of God; is the constant refrain of their liturgy. Consequent on this is the careful avoidance of anthropomorphic expressions, which has often been pointed out in the Targum. God created without hands; He rested, but not from weariness. He made man in the image of the angels; and it was an angel who delivered the Law on Sinai. Prayers are offered to Him through the merits ( ) of the Patriarchs and Moses. (2) Moses as the only prophet. None can arise like unto Moses, according to Deut. xxxiv. 10 (where the Targum reads for ); hence they reject all the Jewish books except the Pentateuch. The Law which he gave is perfect, having been created before the world and brought forth by the hand of God from the depth of the very good. (3) Mt. 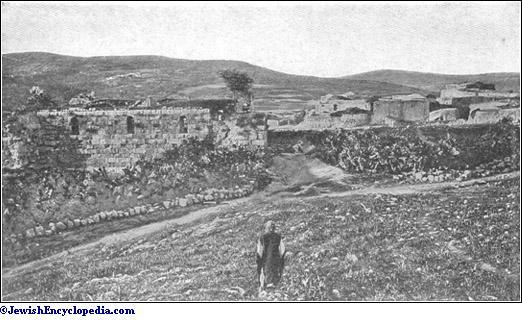 Gerizim, which is the House of God, the place in which He chose to put His name. On it the twelve stones (Deut. xxvii. 4) are still shown; there the temple was erected; and there in the last days will the Shekinah reappear. (4) The Messiah doctrine, which, though of less importance, is clearly defined. The term used is ( ), which has been variously explained as "the restorer" or "he who returns." During all the time that has elapsed since the schism of Eli and the disappearance of the Tabernacle, the world (i.e., Israel) has been suffering under the divine displeasure. This is called the period of . It will be terminated by the coming of the "Taheb," who will restore the period of favor ( ), establish the true religion, and destroy the followers of Ezra. He will live 110 years on earth, and then die. (5) The resurrection, which will take place after the death of the Taheb, and will be accompanied by the final judgment, , when the righteous will go into the garden of Eden, and the wicked be burned with fire. The Samaritans dwell at length on this doctrine in the funeral service. Some kind of forgiveness seems, however, to be possible after death for the faithful who die in their sins; for prayers are offered on their behalf. Although the views sketched here do not differ fundamentally from Jewish beliefs, the details, or rather the restrictions, are no doubt due to that old Israelitish point of view which the Samaritans never really abandoned. The later developments, however, and even the terminology are often due to Moslem influence. Nor is this surprising in a people living among and entirely overshadowed by Mohammedans, speaking their language and in daily contact with them. At the present day, however, Samaritan learning and thought have practically ceased to exist. The venerable but unhappy remnant seems wholly occupied with the material problems of a struggle for existence, which can hardly be long continued. Most noticeable is the great preponderance of males over females; indeed, this is one of the most serious problems confronting the Samaritans at the present time. Trustworthy evidence points to the fact that in modern times there has been but little if any intermarrying with the other peoples of Syria. The Samaritans themselves claim the perfect purity of their stock. Only as a last resort would they seek wives outside their own sect; and in this case they would naturally wish to marry among the people of the most closely allied religion, the Jewish. The Jews hate and despise the Samaritans with the greatest bitterness, and would do all in their power to prevent marriages between the two sects. 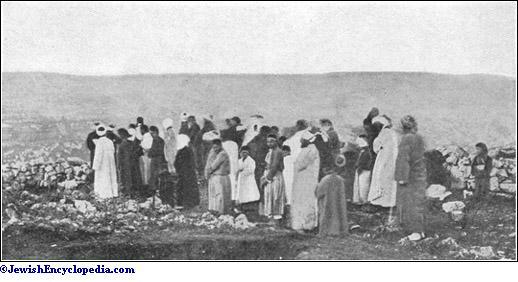 Syrian Christians and "Moslems would be equally averse to intermarrying with the Samaritans, both on account of their natural antipathy to this sect, and on account of the hardships which women must endure according to the rules of the Samaritan religion. These two factors, the natural inclination of the Samaritans to marry strictly among themselves, and the difficulty of forming marriages with other sects of Syria, would combine to preserve the purity of the stock, and at the same time to promote degeneracy by close interbreeding. The statistics given in this article are based on measurements and other observations made on a series of forty-three male Samaritans. As eight of the individuals examined were less than twenty years of age, the averages have been made from the measurements of only thirty-five of the men. Height, standing 1,730. 1,840. 1,630. Length of head 188. 201. 172. Breadth of head 147. 157. 137. Height of head (projection from tragus to vertex) 140. 158. 131. Height of face (nasion-mentum) 125. 140. 107. Height of face (nasion-mouth) 79. 90. 71. Breadth of face 132. 147. 123. Interocular breadth 30. 34. 26. Minimum frontal breadth 103. 116. 97. Length of nose 55. 63. 47. Breadth of nose 37. 42. 30. Breadth of mouth 52. 61. 46. Thickness of lips 17. 28. 11. Length of right ear 65. 75. 53. Length of second finger 103. 114. 96. Breadth of hand 84. 92. 78. Strength of right hand 33.7 62. 18. Strength of left hand 30.2 57.5 16. 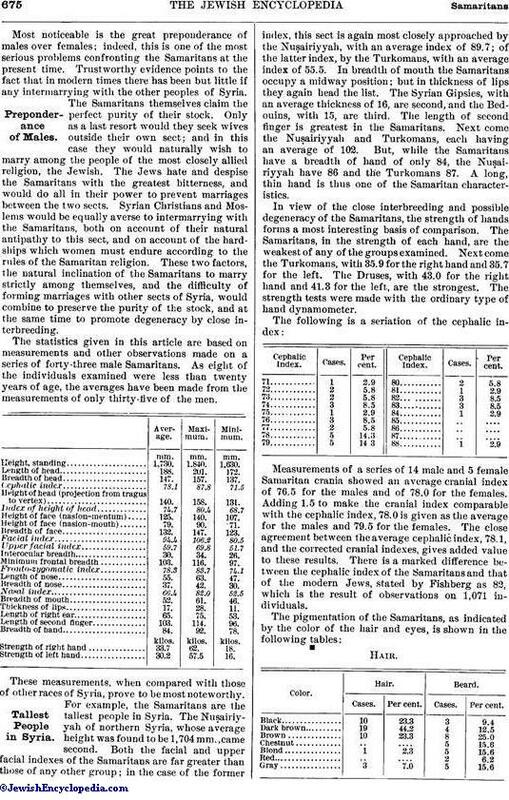 These measurements, when compared with those of other races of Syria, prove to be most noteworthy. For example, the Samaritans are the tallest people in Syria. The Nuṣairiyyah of northern Syria, whose average height was found to be 1,704 mm., came second. Both the facial and upper facial indexes of the Samaritans are far greater than those of any other group; in the case of the former index, this sect is again most closely approached by the Nuṣairiyyah, with an average index of 89.7; of the latter index, by the Turkomans, with an average index of 55.5. In breadth of mouth the Samaritans occupy a midway position; but in thickness of lips they again head the list. 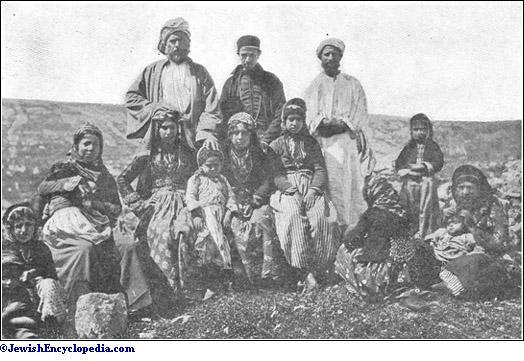 The Syrian Gipsies, with an average thickness of 16, are second, and the Bedouins, with 15, are third. The lenght of second finger is greatest in the Samaritans. Next come the Nuṣairiyyah and Turkomans, each having an average of 102. But, while the Samaritans have a breadth of hand of only 84, the Nuṣairiyyah have 86 and the Turkomans 87. A long, thin hand is thus one of the Samaritan characteristics. In view of the close interbreeding and possible degeneracy of the Samaritans, the strength of hands forms a most interesting basis of comparison. The Samaritans, in the strength of each hand, are the weakest of any of the groups examined. Next come the Turkomans, with 35.9 for the right hand and 35.7 for the left. The Druses, with 43.0 for the right hand and 41.3 for the left, are the strongest. The strength tests were made with the ordinary type of hand dynamometer. Measurements of a series of 14 male and 5 female Samaritan crania showed in average cranial index of 76.5 for the males and of 78.0 for the females. Adding 1.5 to make the cranial index comparable with the cephalic index, 78.0 is given as the average for the males and 79.5 for the females. The close agreement between the average cephalic index, 78.1, and the corrected cranial indexes, gives added value to these results. There is a marked difference between the cephalic index of the Samaritans and that of the modern Jews, stated by Fishberg as 82, which is the result of observations on 1,071 individuals. These tables make it clear that the Samaritans are by no means an exclusively brunette type. As seen by the presence of blue eyes and light hair or beards in a considerable percentage of the individuals examined, there is, on the contrary, a distinct blond type noticeable in the group. The general type of physiognomy of the Samaritans is distinctly Jewish, the nose markedly so. 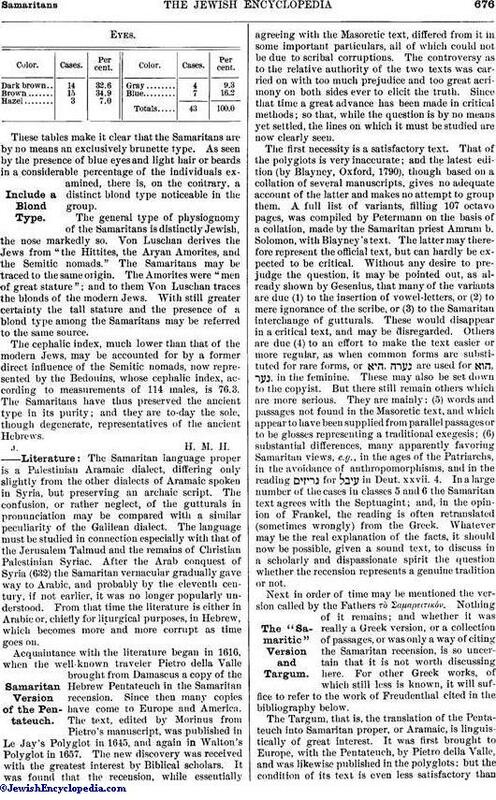 Von Luschan derives the Jews from "the Hittites, the Aryan Amorites, and the Semitic nomads." The Samaritans may be traced to the same origin. The Amorites were "men of great stature"; and to them Von Luschan traces the blonds of the modern Jews. With still greater certainty the tall stature and the presence of a blond type among the Samaritans may be referred to the same source. 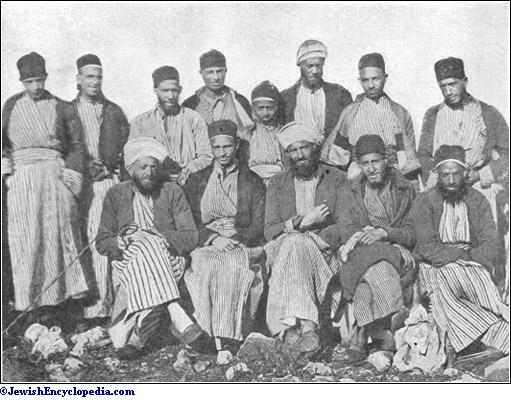 The cephalic index, much lower than that of the modern Jews, may be accounted for by a former direct influence of the Semitic nomads, now represented by the Bedouins, whose cephalic index, according to measurements of 114 males, is 76.3. The Samaritans have thus preserved the ancient type in its purity; and they are to-day the sole, though degenerate, representatives of the ancient Hebrews. 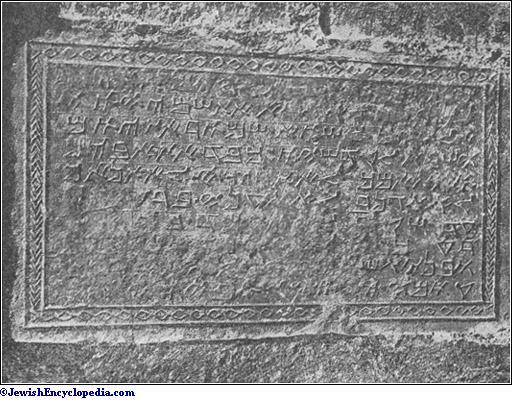 The Samaritan language proper is a Palestinian Aramaic dialect, differing only slightly from the other dialects of Aramaic spoken in Syria, but preserving an archaic script. The confusion, or rather neglect, of the gutturals in pronunciation may be compared with a similar peculiarity of the Galilean dialect. The language must be studied in connection especially with that of the Jerusalem Talmud and the remains of Christian Palestinian Syriac. After the Arab conquest of Syria (632) the Samaritan vernacular gradually gave way to Arabic, and probably by the eleventh century, if not earlier, it was no longer popularly understood. From that time the literature is either in Arabic or, chiefly for liturgical purposes, in Hebrew, which becomes more and more corrupt as time goes on. Acquaintance with the literature began in 1616, when the well-known traveler Pietro della Valle brought from Damascus a copy of the Hebrew Pentateuch in the Samaritan recension. Since then many copies have come to Europe and America. The text, edited by Morinus from Pietro's manuscript, was published in Le Jay's Polyglot in 1645, and again in Walton's Polyglot in 1657. The new discovery was received with the greatest interest by Biblical scholars. It was found that the recension, while essentially agreeing with the Masoretic text, differed from it in some important particulars, all of which could not be due to scribal corruptions. The controversy as to the relative authority of the two texts was carried on with too much prejudice and too great acrimony on both sides ever to elicit the truth. Since that time a great advance has been made in critical methods; so that, while the question is by no means yet settled, the lines on which it must be studied are now clearly seen. The first necessity is a satisfactory text. That of the polyglots is very inaccurate; and the latest edition (by Blayney, Oxford, 1790), though based on a collation of several manuscripts, gives no adequate account of the latter and makes no attempt to group them. A full list of variants, filling 107 octavo pages, was compiled by Petermann on the basis of a collation, made by the Samaritan priest Amram b. Solomon, with Blayney's text. The latter may therefore represent the official text, but can hardly be expected to be critical. Without any desire to prejudge the question, it may be pointed out, as already shown by Gesenius, that many of the variants are due (1) to the insertion of vowel-letters, or (2) to mere ignorance of the scribe, or (3) to the Samaritan interchange of gutturals. These would disappear in a critical text, and may be disregarded. Others are due (4) to an effort to make the text easier or more regular, as when common forms are substituted for rare forms, or are used for , , in the feminine. These may also be set down to the copyist. But there still remain others which are more serious. They are mainly: (5) words and passages not found in the Masoretic text, and which appear to have been supplied from parallel passages or to be glosses representing a traditional exegesis; (6) substantial differences, many apparently favoring Samaritan views, e.g., in the ages of the Patriarchs, in the avoidance of anthropomorphisms, and in the reading for in Deut. xxvii. 4. In a large number of the cases in classes 5 and 6 the Samaritan text agrees with the Septuagint; and, in the opinion of Frankel, the reading is often retranslated (sometimes wrongly) from the Greek. Whatever may be the real explanation of the facts, it should now be possible, given a sound text, to discuss in a scholarly and dispassionate spirit the question whether the recension represents a genuine tradition or not. Next in order of time may be mentioned the version called by the Fathers τὸ ΣαΜαρειτικόν. Nothing of it remains; and whether it was really a Greek version, or a collection of passages, or was only a way of citing the Samaritan recension, is so uncertain that it is not worth discussing here. For other Greek works, of which still less is known, it will suffice to refer to the work of Freudenthal cited in the bibliography below. The Targum, that is, the translation of the Pentateuch into Samaritan proper, or Aramaic, is linguistically of great interest. It was first brought to Europe, with the Pentateuch, by Pietro della Valle, and was likewise published in the polyglots; but the condition of its text is even less satisfactory thanthat of the Pentateuch. Petermann did indeed begin an edition, which was ably completed from his materials by Vollers; but it suffers from his having left no account of the manuscripts used. Any future edition must take account of the other dialects of Palestinian Aramaic, and of the work of Marḳah and the earlier liturgies. Very few complete manuscripts of the Targum exist in Europe; and these were all made long after the language had become extinct. The oldest is the Barberini Triglot (1226 C.E. ); but there are considerable fragments, undated, which may be equally old. Exegetically the Targum is of less importance, though it presents many interesting problems. It often agrees strangely with Onḳelos, while in other places it differs from him without any apparent reason. Probably both versions go back ultimately to one oral Aramaic rendering which was traditional in Palestine and was written down with local differences. Kohn gives reasons for believing that it is a composite work by several hands, of various dates. Some parts of it, and some copies (especially Petermann's manuscript C) are strongly marked by Hebraisms, which Kohn considers to have been introduced at a late period. When the version, or any part of it, was written down, it is very difficult to decide. The only evidence available must be sought in a comparison with the work of Marḳah and the early liturgy. The most probable view seems to be that it is in the main a work of the fourth century of the common era. Native tradition is said to ascribe it to Nathanael, who died about 20 B.C. (Nutt, p.108). The tradition may represent a fact if it means Nathanael the high priest, who was the father of Baba Rabba, and lived at the beginning of the fourth century C.E. This was a time of religious revival, when the liturgy was restored; and possibly Nathanael may have caused the Targum to be written down for use in the services. The Samaritan-Arabic version exists in a number of manuscripts. The question of its author and date is full of difficulty, and has only recently been investigated in a really scholarly manner by Paul Kahle. 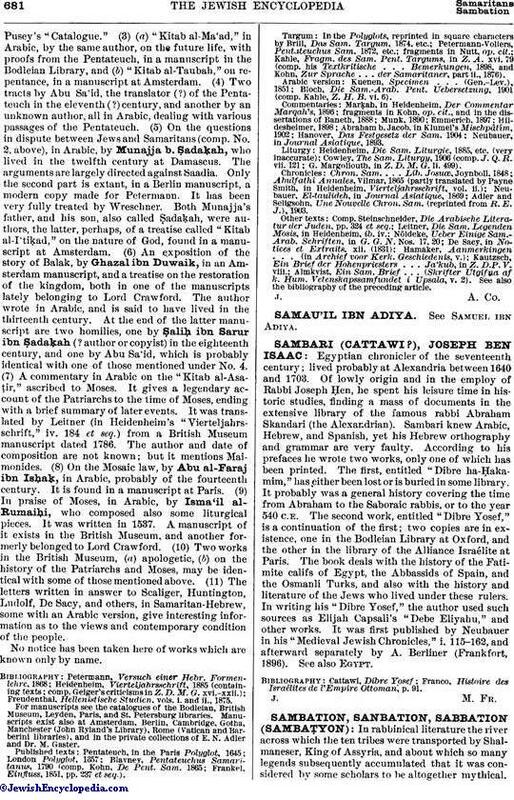 His results are briefly these: the differences in the texts of various manuscripts represent different recensions; the original author was perhaps Abu al-Ḥasan of Tyre, and not, as is usually supposed, Abu Sa'id; the work was revised by Abu Sa'id in the thirteenth century, and this recension is the authorized Samaritan-Arabic version; there were, however, other recensions, some showing considerable divergence from that of Abu Sa'id. In the main, these conclusions must be accepted, although Kahle's further investigations may modify some of them; but the date assigned to Abu Sa'id is not very convincing. There were certainly two persons of the name, who are not always easily to be distinguished. The first three books were published by Kuenen; but the whole text requires accurate editing before its character can be properly estimated. The translation is careful and close to the Hebrew. It is independent of Saadia, but bears some sort of relation to him. Whether, or how far, Saadia was directly used by the original translator, it is hard to say. It would, however, be natural that subsequent recensions should owe much to him. The relation of the translation to the Targum is also undetermined. 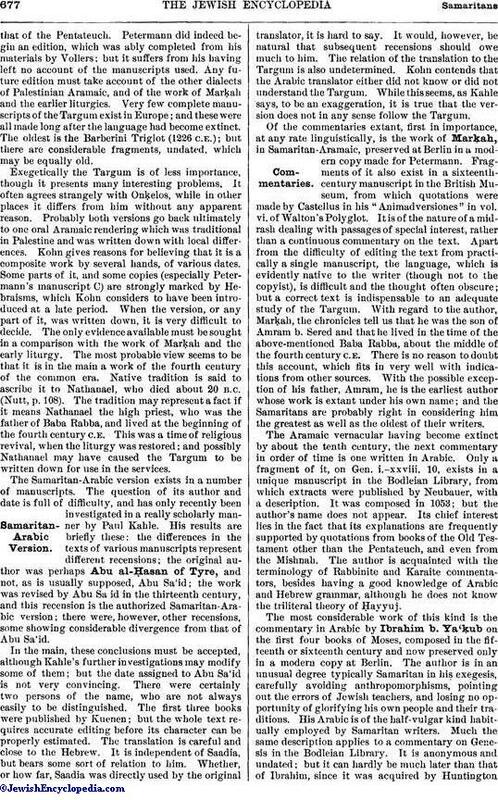 Kohn contends that the Arabic translator either did not know or did not understand the Targum. While this seems, as Kahle says, to be an exaggeration, it is true that the version does not in any sense follow the Targum. Of the commentaries extant, first in importance, at any rate linguistically, is the work of Marḳah, in Samaritan-Aramaic, preserved at Berlin in a modern copy made for Petermann. Fragments of it also exist in a sixteenth-century manuscript in the British Museum, from which quotations were made by Castellus in his "Animadversiones" in vol. vi. of Walton's Polyglot. It is of the nature of a midrash dealing with passages of special interest, rather than a continuous commentary on the text. Apart from the difficulty of editing the text from practically a single manuscript, the language, which is evidently native to the writer (though not to the copyist), is difficult and the thought often obscure; but a correct text is indispensable to an adequate study of the Targum. With regard to the author, Marḳah, the chronicles tell us that he was the son of Amrarm b. Sered and that he lived in the time of the above-mentioned Baba Rabba, about the middle of the fourth century C.E. There is no reason to doubt this account, which fits in very well with indications from other sources. With the possible exception of his father, Amram, he is the earliest author whose work is extant under his own name; and the Samaritans are probably right in considering him. the greatest as well as the oldest of their writers. The Aramaic vernacular having become extinct by about the tenth century, the next commentary in order of time is one written in Arabic. Only a fragment of it, on Gen. i.-xxviii. 10, exists in a unique manuscript in the Bodleian Library, from which extracts were published by Neubauer, with a description. It was composed in 1053; but the author's name does not appear. Its chief interest lies in the fact that its explanations are frequently supported by quotations from books of the Old Testament other than the Pentateuch, and even from the Mishnah. The author is acquainted with the terminology of Rabbinite and Karaite commentators, besides having a good knowledge of Arabic and Hebrew grammar, although he does not know the triliteral theory of Ḥayyuj. The most considerable work of this kind is the commentary in Arabic by Ibrahim b. Ya;ḳub on the first four books of Moses, composed in the fifteenth or sixteenth century and now preserved only in a modern copy at Berlin. The author is in an unusual degree typically Samaritan in hiṣ exegesis, carefully avoiding anthropomorphisms, pointing out the errors of Jewish teachers, and losing no opportunity of glorifying his own people and their traditions. His Arabic is of the half-vulgar kind habitually employed by Samaritan writers. Much the same description applies to a commentary on Genesis in the Bodleian Library. It is anonymous and undated; but it can hardly be much later than that of Ibrahim, since it was acquired by Huntingtonabout 1680. Only ch. xlix. has been published (in Eichhorn's "Repertorium"). In 1753 Ghazal ibn Abi al-Sarur wrote a commentary in Arabic on Genesis and Exodus, entitled "Kashf al-Ghaya'ib," which exists in a manuscript in the British Museum. No part of it has been published. An Arabic commentary on the story of Balak, written by Ghazal ibn al-Duwaik (said to have lived in the 13th cent. ), exists in a manuscript at Amsterdam; but none of it has been published. The few anonymous fragments and the names of authors whose works are lost need not be mentioned here. The liturgies, a large and important part of the literature, are very imperfectly known at present. A number of selections have been published by Heidenheim; but, while he deserves full credit for first bringing them to notice, it must be confessed that, from the unsatisfactory manner in which the texts are edited and from the disconnected form in which they are published, very little use can be made of them. The manuscripts are very numerous, but nearly all of recent date. The cycle consists of the following divisions: (1) the "Defter"; (2) the services for the first month, chiefly Passover and Maẓẓot; (3) those for the seven Sabbaths following Passover, for , and for the Feast of Harvest; (4) those for the seventh month, including the ten days of pardon ( ) and those for the Day of Atonement and Sukkot; (5) those for circumcision, marriage, and burial. Of these the "Defter" (Διφθέρα), the book par excellence, stands first in date and in importance. It seems to have been the nucleus of the liturgy, a sort of manual containing prayers, etc., suitable for various occasions. Religious services had no doubt always been held at the seasons ordained in the Pentateuch; but, whatever formularies were used, they have been entirely lost. The "Defter" marks a definitely new departure in the fourth century, as the special services show a new departure in the fourteenth century. It was composed by various authors, the chief being Marḳah, who, according to the chronicle, set in order the services of the synagogue for Baba Rabba in the fourth century. Another division of it, called the "Durran," is by a certain Amram , who may well be identical with the Amram b. Sered mentioned as the father of Marḳah. Both these authors write in the true Samaritan-Aramaic, Amram being perhaps the more obscure. His work is chiefly in prose, and consists of prayers, etc., for various occasions. Marḳah's work, on the other hand, shows a development in literary form, being more artistic, or perhaps artificial, in form. It consists of alphabetical hymns, each stanza having four members, but without rime. These together form the basis, and probably the oldest part, of the "Defter." At the beginningof the volume are some anonymous prayers—a prayer of Moses, a prayer of Joshua, and the prayers of the angels. Some of these are undoubtedly old; but, curiously enough, they do not appear in all the manuscripts, and their date is quite uncertain. Bañeth conjectures that the prayer of Joshua is by a certain Joshua b. Baraḳ b. 'Eden, the patron of Amram b. Sered, and so an elder contemporary of Marḳah. But the identification rests on very slight evidence; and the prayer seems to be composite, or to combine two recensions. These introductory pieces are partly in Samaritan-Hebrew. Another writer of this period was perhaps Nanah b. Marḳah, if, as was probably the case, he was the son of the great Marḳah. His style, though not equal to Marḳah's, is similar. Manuscripts of the "Defter" are not numerous. The oldest are one in the Vatican Library, not dated, but perhaps of the thirteenth century, and one, dated 1258, in the British Museum. Others more or less complete are: one in Paris; one in Berlin; two formerly belonging to the Earl of Crawford, now in the John Rylands Library at Manchester; one in Keble College, Oxford; and some fragments. There is a very clear distinction between the earlier and the later manuscripts, the text having evidently been edited at some time after the thirteenth century. To this nucleus other work was added from time to time. Abu al-Ḥasan of Tyre, who lived in the eleventh century, wrote a very popular hymn ( ). He is no doubt identical with Ab Ḥasdah, who, as well as his son Ab Gelugah, wrote liturgical compositions. They still used Aramaic, though of a less pure kind than Marḳah's. The language seems to be already dead, and was only employed by them as being still considered the proper vehicle for liturgy. Then for three centuries no change appears to have been made. In the fourteenth century additions were made by Joseph ha-Rabban, by Phinehas the high priest (perhaps Joseph's son), and by Abisha, a younger son of Phinehas. These three took the bold step of abandoning Aramaic for Hebrew, which henceforth becomes the regular language for liturgical purposes. In the fourteenth century there seems to have been a sort of renascence of Samaritan literature, which is very clearly seen in the development of the liturgy, and which was probably due to the high priest Phinehas b. Joseph. It was at his instigation that Abu al-Fatḥ wrote his chronicle (see below); and from the account there given it may be gathered that Phinehas was a man of exceptional character. At any rate, the elaboration of the liturgy must have received a fresh impetus about this time, as is seen from the inclusion of the fourteenth-century compositions in the "Defter." With them the "Defter" was finally closed; but the new literary or religious activity continued to show itself in the composition of special services. It is impossible to say when any of these took its present shape. From the dates of the writers it is clear that the growth was gradual and that it began with Phinehas and Abisha. In all the services the framework is similar, and perhaps always was so; but additional hymns continued to be included from time to time. The least change was made in the case of the service for the or pilgrimage up Mt. Gerizim, the most sacred function of all. Many of the hymns are of great length, generally alphabetical (sometimes also acrostic), in double lines, each section riming throughout on the same syllable. The Hebrew varies in quality according to the writer, and is generally very corrupt and obscure, being often mixed with Aramaic words and Arabic idioms, the latter increasing as time goes on. The chief writers of whom anything is known are the following: Abisha b. Phinehas, mentioned above, who was very prolific and was, next to Marḳah, the most original and literary of the liturgists. He died comparatively young in 1376. His brother Eleazar the high priest (d. 1387), and his son Phinehas, also high priest (d. 1440), wrote a few pieces. Abisha died before his son Phinehas was born; and the child was brought up by his uncle Eleazar till he was in his eleventh year. Eleazar then died, after appointing as his nephew's guardian a certain Abdallah b. Solomon, to whose care Phinehas pays a grateful tribute in one of his compositions. Abdallah (who was a kohen) wrote a great number of liturgical pieces, among them being a large part of the marriage service. Nothing further is known of him; but as he must have been a man of mature years in 1387, his work can not be later than 1400. In style he is not much inferior to Abisha. His collaborator in the marriage service was Sa'd Allah ben Ṣadaḳah al-Kathari, who wrote also other pieces. There are no clear indications of his date; but, as he seems to have been a contemporary of Abdallah, he must have lived about 1400. He was probably of a Damascus family. A later high priest named Phinehas, no doubt one of the authors of that name, removed from Damascus to Nablus in 1538, accompanied by his assistant, Abdallah b. Abraham. The latter was an important author; and his father is probably to be identified with Abraham Ḳabaẓi, a writer of great reputation, as prolific as Abdallah b. Solomon, and perhaps equal to him in literary merit. In one of his hymns Abraham Ḳabaẓi speaks of himself as a pupil of the high priest Phinehas. Among other works he wrote a large part of the hymns for the or pilgrimage up Mt. Gerizim. Lesser writers are here omitted, as well as many whose names, being not distinctive, afford no clew to their identity. The extension of the liturgy, however, did not cease with the sixteenth century. It has continued down to the present day, although literary merit has become less and less common. Most of the later copyists added something to the original stock. There are several members of the Danfi family: Marjan (= Ab Sekhuah) b. Ibrahim (about 1700), his son Meshalmah, his grandson Marjan, and his great-grandson Abdallah, who was writing as early as 1754. Of the Levitical family the best-known is the priest Ṭabyah (= Ghazal), a prolific and occasionally meritorious writer, who died in 1786. His son Solomon, also priest, who died at a great age in 1856(7), and his grandson, the priest Amram, who died in 1874, exhibit perhaps the extremeof decadence both in language and in thought. The latest addition is by Phinehas b. Isaac, nephew of Amram, who was living in 1894. Of the chronicles the earliest extant is that called "Al-Taulidah." The first part of it is ascribed to Eleazar, a younger son of the high priest Amram, writing in 1149. It was brought down to his own time by Jacob b. Ishmael, priest at Damascus in 1346, and afterward continued by others to the death of the priest Solomon in 1856(7). It is in Hebrew, and begins with an account of the traditional calculation of the festivals and the jubilees, as handed down from Adam to Phinehas, the grandson of Aaron, and through him to the existing priestly family. This introduction is by Jacob b. Ishmael. The chronicle proper begins with Adam, giving at first little more than the names and ages of the Patriarchs, and recounting how, in the days of Uzzi, the sixth priest after Aaron, the Tabernacle was destroyed, and the divine favor lost. The history becomes fuller from this point. It is fullest and most trustworthy in regard to the period just before 1149, when Eleazar made the first draft, and that before 1346, when Jacob continued it. The name of the later continuator is not given. As to the historical value of this and the other chronicles, it must be admitted that for events not immediately concerning the tribe, their chronology is erratic. Moreover, dates are only occasionally given. On the other hand, for domestic details, especially at the dates mentioned above, the chronicles seem to be quite trustworthy; and for the rest, though dates can not always be made out, the chroniclers are probably correct in their grouping of persons. The next work of the kind in point of time is that called the "Book of Joshua" (See Joshua, the Samaritan Book of), composed, as Juynboll held, in the thirteenth century. Baneth is certainly mistaken in thinking that it owes its name to Joshua b. Baraḳ (see above). It is so called simply as relating chiefly the exploits of the Biblical Joshua; and its author is not known. It is in Arabic, and is in no sense a translation of the canonical book, being full of mythical stories, and of much less historical value than "Al-Taulidah." Both of the foregoing, as well as other chronicles not now extant, were used by Abu al-Fatḥ, who compiled his work, in Arabic, in 1355, for the high priest Phinehas. As history, Abu al-Fatḥ's chronicle has most of the defects of the other two. Nevertheless the author certainly seems to have had some idea, however slight, of what history should be, and to have taken pains to compile a trust-worthy account from the scanty material at his command. He starts from Adam and originally stopped at the time of Mohammed; but the history has been continued by later writers not named. If it is studied with care, and in connection with other sources, some results may be obtained; but history is not the strong point of the Oriental, and he must not be judged by Western standards, which, after all, are quite modern. Another chronicle has recently been published by E. N. Adler (who had the copy made in Nablus) and M. Seligsohn. It is in Hebrew, and clearly based on "Al-Taulidah." The introduction is omitted, but otherwise the form is the same, and the list of priests agrees exactly (according to the editors) with "Al-Taulidah." It is, however, much fuller, giving not only details, often very inaccurate, of foreign events, but also, what is much more useful, a great deal of information about Samaritan families. It extends from Adam to 1900 C.E. The editors have added a French translation, and notes pointing out its relation to the other chronicles, which greatly add to the usefulness of the edition. In philology, a treatise on pronunciation was written by Abu Sa'id, the translator (?) of the Pentateuch, in the eleventh (?) century, in Arabic. It was published by Nöldeke. It does not attempt to give a complete system of Hebrew pronunciation, but only a series of rules intended to correct errors which the author has observed in his contemporaries. There is also a considerable work on grammar by Ibrahim b. Faraj, who lived in the time of Saladin (12th cent.). His system is based entirely on the Arab grammarians, whom he sometimes quotes word for word; and he probably knew the Jewish grammarians. Although the work is ill arranged and, where he is not following his authorities, incorrect, it has (like the last-mentioned) considerable interest as showing the pronunciation of Hebrew in the writer's own time. 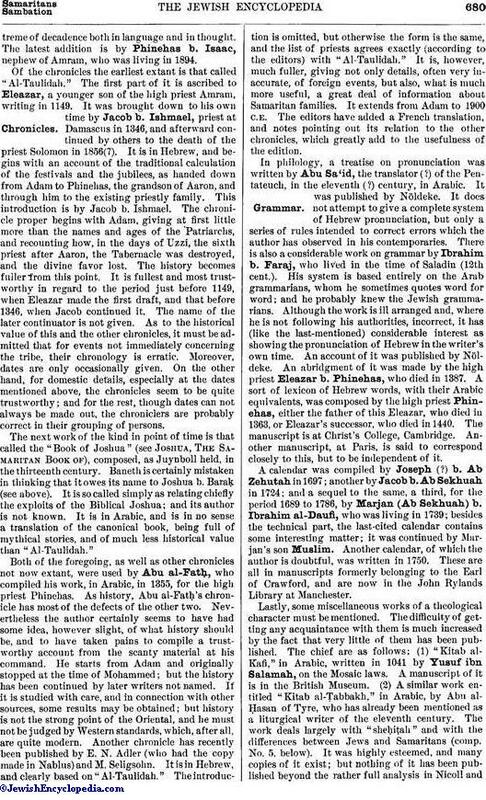 An account of it was published by Nöldeke. An abridgment of it was made by the high priest Eleazar b. Phinehas, who died in 1387. A sort of lexicon of Hebrew words, with their Arabic equivalents, was composed by the high priest Phinehas, either the father of this Eleazar, who died in 1363, or Eleazar's successor, who died in 1440. The manuscript is at Christ's College, Cambridge. Another manuscript, at Paris, is said to correspond closely to this, but to be independent of it. A calendar was compiled by Joseph (?) b. Ab Zehutah in 1697; another by Jacob b. Ab Sekhuah in 1724; and a seguel to the same, a third, for the period 1689 to 1786, by Marjan (Ab Sekhuah) b. Ibrahim al-Daufi, who was living in 1739; besides the technical part, the last-cited calendar contains some interesting matter; it was continued by Marjan's son Muslim. Another calendar, of which the author is doubtful, was written in 1750. These are all in manuscripts formerly belonging to the Earl of Crawford, and are now in the John Rylands Library at Manchester. Lastly, some miscellaneous works of a theological character must be mentioned. The difficulty of getting any acquaintance with them is much increased by the fact that very little of them has been published. The chief are as follows: (1) "Kitab al-Kafi," in Arabic, written in 1041 by Yusuf ibn Salamah, on the Mosaic laws. A manuscript of it is in the British Museum. (2) A similar work entitled "Kitab al-Ṭabbakh," in Arabic, by Abu al-Ḥasan of Tyre, who has already been mentioned as a liturgical writer of the eleventh century. The work deals largely with "sheḥiṭah" and with the differences between Jews and Samaritans (comp. No. 5, below). It was highly esteemed, and many copies of it exist; but nothing of it has been published beyond the rather full analysis in Nicoll andPusey's "Catalogue." (3) (a) "Kitab al-Ma'ad," in Arabic, by the same author, on the future life, with proofs from the Pentateuch, in a manuscript in the Bodleian Library, and (b) "Kitab al-Taubah," on repentance, in a manuscript at Amsterdam. (4) Two tracts by Abu Sa'id, the translator (?) of the Pentateuch in the eleventh (?) 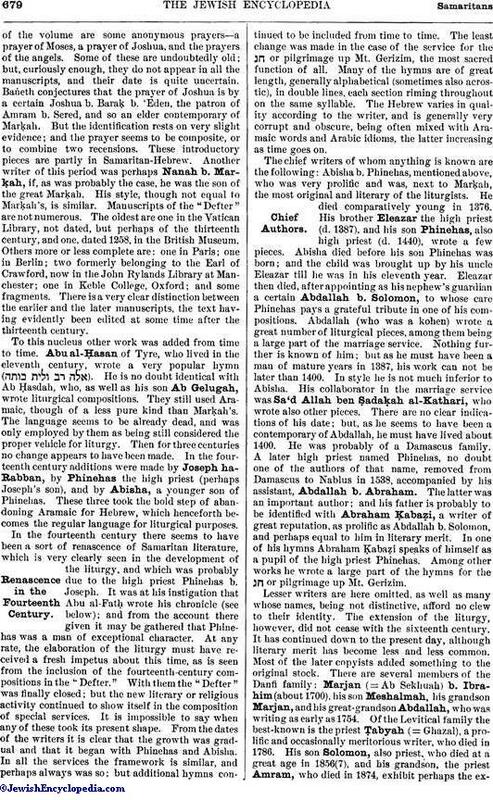 century, and another by an unknown author, all in Arabic, dealing with various passages of the Pentateuch. (5) On the questions in dispute between Jews and Samaritans (comp. No. 2, above), in Arabic, by Munajja b. Ṣadaḳah, who lived in the twelfth century at Damascus. The arguments are largely directed against Saadia. Only the second part is extant, in a Berlin manuscript, a modern copy made for Petermann. It has been very fully treated by Wreschner. Both Munajja's father, and his son, also called Ṣadaḳah, were authors, the latter, perhaps, of a treatise called "Kitab al-I'tiḳad," on the nature of God, found in a manuscript at Amsterdam. (6) An exposition of the story of Balak, by Ghazal ibn Duwaik, in an Amsterdam manuscript, and a treatise on the restoration of the kingdom, both in one of the manuscripts lately belonging to Lord Crawford. The author wrote in Arabic, and is said to have lived in the thirteenth century. At the end of the latter manuscript are two homilies, one by Ṣaliḥ ibn Sarur ibn Ṣadaḳah (?author or copyist) in the eighteenth century, and one by Abu Sa'id, which is probably identical with one of those mentioned under No. 4. (7) A commentary in Arabic on the "Kitab al-Asaṭir," ascribed to Moses. It gives a legendary account of the Patriarchs to the time of Moses, ending with a brief summary of later events. It was translated by Leitner (in Heidenheim's "Vierteljahrsschrift," iv. 184 et seq.) from a British Museum manuscript dated 1786. The author and date of composition are not known; but it mentions Maimonides. (8) On the Mosaic law, by Abu al-Faraj ibn Isḥaḳ, in Arabic, probably of the fourteenth century. It is found in a manuscript at Paris. (9) In praise of Moses, in Arabic, by Isma'il al-Rumaiḥi, who composed also some liturgical pieces. It was written in 1537. A manuscript of it exists in the British Museum, and another formerly belonged to Lord Crawford. (10) Two works in the British Museum, (a) apologetic, (b) on the history of the Patriarchs and Moses, may be identical with some of those mentioned above. (11) The letters written in answer to Scaliger, Huntington, Ludolf, De Sacy, and others, in Samaritan-Hebrew, some with an Arabic version, give interesting information as to the views and contemporary condition of the people. No notice has been taken here of works which are known only by name. Freudenthal, Hellenistische Studien, vols. i. and ii., 1875. For manuscripts see the catalogues of the Bodleian, British Museum, Leyden, Paris, and St. Petersburg libraries. Manuscripts exist also at Amsterdam, Berlin, Cambridge, Gotha, Manchester (John Ryland's Library), Rome (Vatican and Barberini libraries), and in the private collections of E. N. Adler and Dr. M. Gaster. Blayney, Pentateuchus Samaritanus, 1790 (comp. Kohn, De Pent. Sam. 1865; Frankel, Einfluss, 1851, pp. 237 et seq.). Kahle, Fragm. des Sam. Pent. Targums, in Z. A. xvi. 79 (comp. his Textkritische . . . Bemerkungen, 1898, and Kohn, Zur Sprache . . . der Samaritaner, part ii., 1876). Bloch, Die Sam.-Arab. Pent. Uebersetzung, 1901 (comp. Kahle, Z. H. B. vi. 6). Neubauer, in Journal Asiatique, 1893. Cowley, The Sam. Liturgy, 1906 (comp. J. Q. R. vii. 121; G. Margoliouth, in Z. D. M. G. li. 499). Adler and Seligsohn, Une Nouvelle Chron. Sam. (reprinted from R. E. J. ), 1903. Almkvist, Ein Sam. Brief . . . (Skrifter Utgifua af k. Hum. Vetenskapssamfundet i Upsala, v. 2). See also the bibliography of the preceding article.